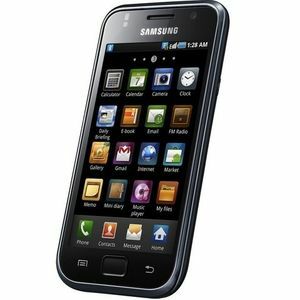 The Samsung Galaxy S I9000 is Samsung's first entry into its Galaxy S series of Android smartphones. The Galaxy S features a 480x800 Super AMOLED touchscreen display, a 5 MP rear camera, a 0.3 MP VGA front-facing camera, and a 1 GHz processor. It ships with Android 2.1 Eclair and can be upgraded to Android 2.3 Gingerbread. The Galaxy S is just 9.9 mm in thickness, which made it the thinnest smartphone on the market when it was released.